The confirmation battles over President Donald Trump’s nominees didn’t end when the Republican-led Senate changed its rules in early April to enable simple majorities to end filibusters on Supreme Court nominations. Nor did they end when Trump’s final Cabinet pick, Alexander Acosta, was confirmed as labor secretary later that same month. In fact, they’re still happening: Trump’s nominees for lower-level government posts have already faced the second-highest number of Senate cloture votes in a single Congress. Less than five months into Trump’s tenure, 25 of his executive and judicial nominees have been the subjects of votes on cloture – the Senate term for limiting debate and moving a bill, nominee or other issue to a final up-or-down vote. That’s more than have occurred during the entire term of all but one Congress since 1949, when the Senate first allowed cloture to be moved on nominations, and Trump has yet to nominate people to fill hundreds of other executive-branch jobs. The exception mentioned above – the 113th Congress of 2013-14, which held a record 150 cloture votes on nominations by newly re-elected President Barack Obama – illuminates how the politics of presidential nominations have changed dramatically in the past few decades. From a relative rarity, invoking cloture to try to push presidential nominations past a recalcitrant minority has become almost routine. That’s been especially true since November 2013, when Democrats changed Senate rules to allow a simple majority, rather than a three-fifths supermajority, to close off debate and force a final vote on all nominations except those to the Supreme Court. 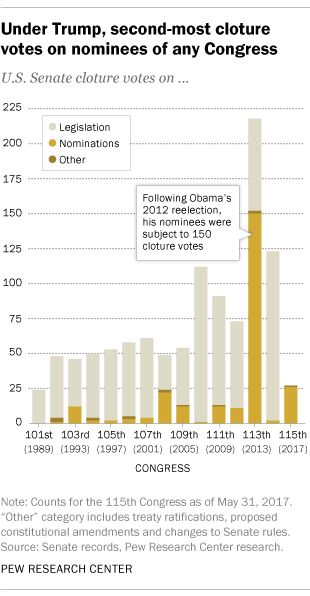 The change followed the GOP minority’s filibustering of dozens of Obama nominees. It’s worth noting that while cloture votes are the only way to end debate on a particular issue, they’re not necessarily a proxy for the number of filibusters. That’s because not all filibusters prompt cloture efforts, and also because Senate leaders frequently file cloture motions to keep Senate business moving smoothly, even in the absence of any overt filibuster. Even though the Senate first allowed cloture to be sought on nominations in 1949, it wasn’t until the 1968 nomination of Abe Fortas to be chief justice of the Supreme Court that it was actually attempted. The cloture vote failed, and Fortas was not confirmed. 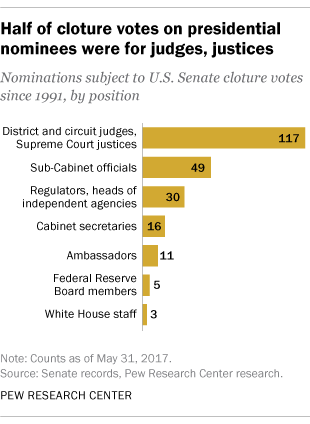 Over the next two decades, cloture was sought only 10 times on nominations and was actually invoked eight times, primarily for judicial positions, according to a Congressional Research Service report. But since 1992, according to Pew Research Center tabulations of Senate data, 232 individual nominees have been subject to at least one cloture vote. 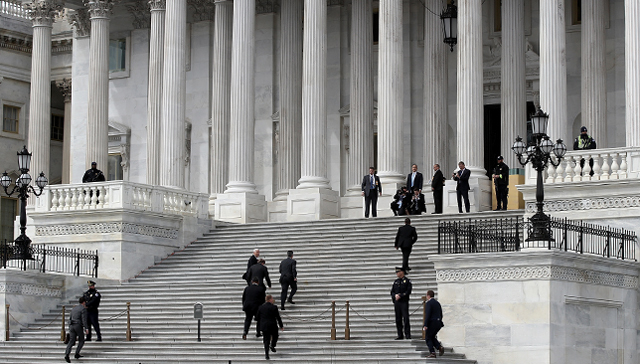 Most people whose nominations went through the cloture process eventually were confirmed. Of 75 such nominees from 1992 to the November 2013 rule change, all but 12 ultimately were confirmed. But eliminating the supermajority requirement for all but Supreme Court nominees made confirmation a near-sure thing. Since that change, only one nominee has failed to have cloture invoked on his behalf: Debo Adegbile, nominated by Obama in 2013 to head the Justice Department’s Civil Rights Division. As of May 31, the Senate has confirmed 38 Trump nominees to key executive-branch positions, according to a database of “key positions” maintained jointly by The Washington Post and the Partnership for Public Service (including one person filling two top State Department posts). Twenty-three of those nominees, along with two judicial nominees, have had to clear the cloture hurdle before their appointments could be voted up or down. One possible factor: Some liberal activists have called on Senate Democrats to delay every Trump nominee for as long as possible, even if they can’t ultimately block confirmation. According to the same database, Trump has 63 nominations for key positions awaiting Senate action; 15 more have been announced but not yet formally presented to the Senate for confirmation. That’s still significantly fewer appointments than previous presidents have made at this point in their first terms, according to the nonpartisan White House Transition Project. Out of the 559 positions being tracked by the Post and the Partnership, 442 are still awaiting nominees. Cloture votes on legislation, which still require a three-fifths vote, also have increased over time (though there haven’t been any so far this year). In the 114th Congress (2015-16), there were 121 distinct cloture votes on bills, amendments and related motions, compared with just 24 in the 101st Congress (1989-90). But some have wondered, given the partisan temper of the times, whether the legislative filibuster’s days are numbered; Trump himself, in a recent tweet, has urged the Senate to get rid of it.